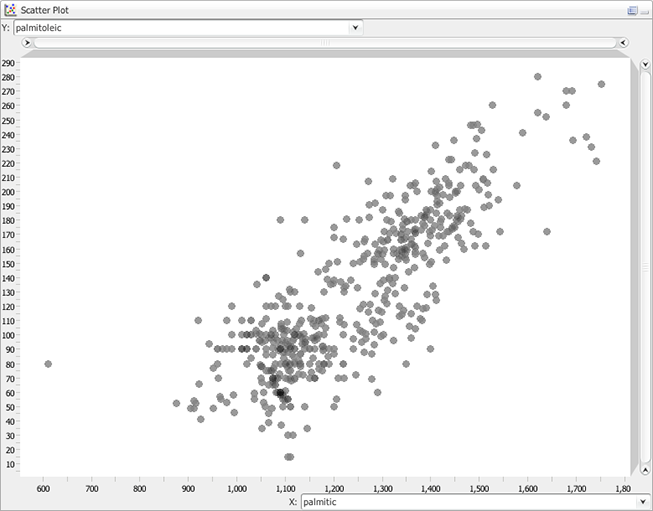 The Scatter Plot view allows you to create a scatter plot of the data. Any combination of numerical variables can be used to map to the x- and y-axes as well as size and color of the glyphs. To configure which of the numerical variables should be mapped to the x- and y-axes, use the drop-down lists located at the end of the axes. The color and size of the markers are determined the same way as for the other views, i.e. the definitions in the drop-down lists in the Configuration panel. You can zoom in by using the range sliders on the top and to the right of the display area. You can zoom out by double-clicking anywhere on the slider. And of course the mouse wheel also works. Selection can be performed by clicking on a marker. Adding to or removing items from the selection can be done by holding the Ctrl key down while clicking on markers.